This diplomawork from Varol Okan was done between 23.09.96 and 23.12.96 at the FH-Dieburg. 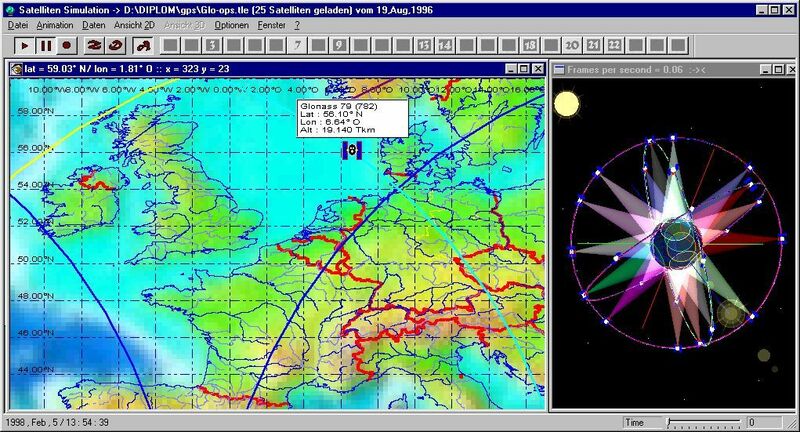 The program calculates the actual position of the satellites using the NORAD2LINE-element set, which is available via the Internet, for nearly all satellites. The position is then displayed in 3D-view as well as in 2D (mercator) view, where the footprints are also be shown. New in version 2.4 is the Weather dialog and the Internet dialog. Check them out. I did also some major internal restructuring on the graphics engine so that you can now use JPEG, GIF, EMF, WMF, TIFF, PCX, and BMP as Textures. The program needs Windows NT/95, the OpenGL DLL's and a color depth of at least 16 bit (65535 colors). See also Glossary for used terms. 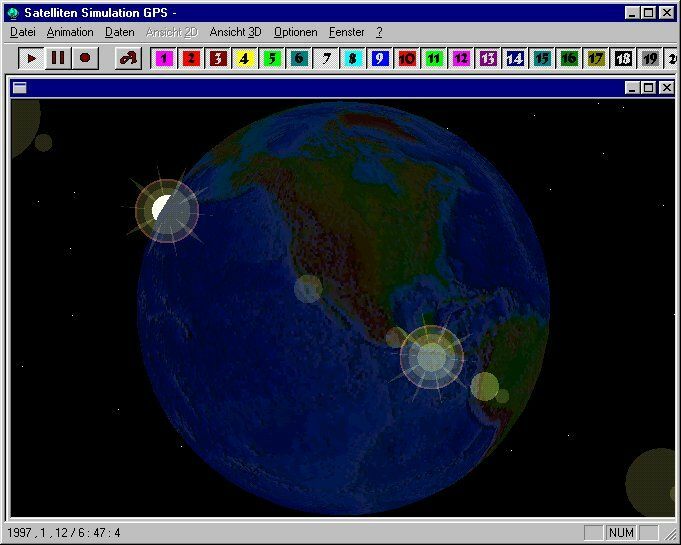 The Global Positioning System (GPS), which was developed in 1978 for the American Department of Defense (DoD) as successor for the TRANSIT system (the first US-Satellite navigation system), is one of two actual working Global Navigation Satellite Systems (GNSS). The second system which is actually in use is GLObal NAvigation Satellite System (GLONASS) from Russia. This system also needs 24 satellites and has been fully functional since 1995. The GPS-Navigation is based on the distance calculation to the NAVSTAR-satellites in space. The distance is received by calculating the time span for the signal to reach the receiver. With this information, it is also possible to get velocity information. GPS is not only used for aeronautic and aquanautic facilities; you can also find GPS receiver in security or transportation systems and lots of other systems. This diplomawork was programmed to display the complex mathematics behind the position determination of satellites while also showing the footprints of satellites in a simple and understandable manner. The algorithms used within this program are the WGS72 implementation of the SGP4 and SDP4 orbital model, programmed by Dr.TS.Kelso [tskelso@celestrak.com] in Turbo Pascal and then converted into a C++ Dynamic Link Library (sgpsdp.dll). The input format for the satellites is the NORAD 2 LINE element set which can be found at the specified links (see Internetlinks). I.e. you can use this program not only for the GPS-satellites but for all other satellites as well. See also the OnLine User-Manual. Or download the zipped version (793.931 Bytes). After receiving a couple of e-mails stating differences between GPS, and other prediction programs, I decided, to go ahead and put a Product Assurance page up. The program can't make Coffee. This feature will probably be included in version XP. It's possible to give a visual understanding of the math behind the satellite position calculation. 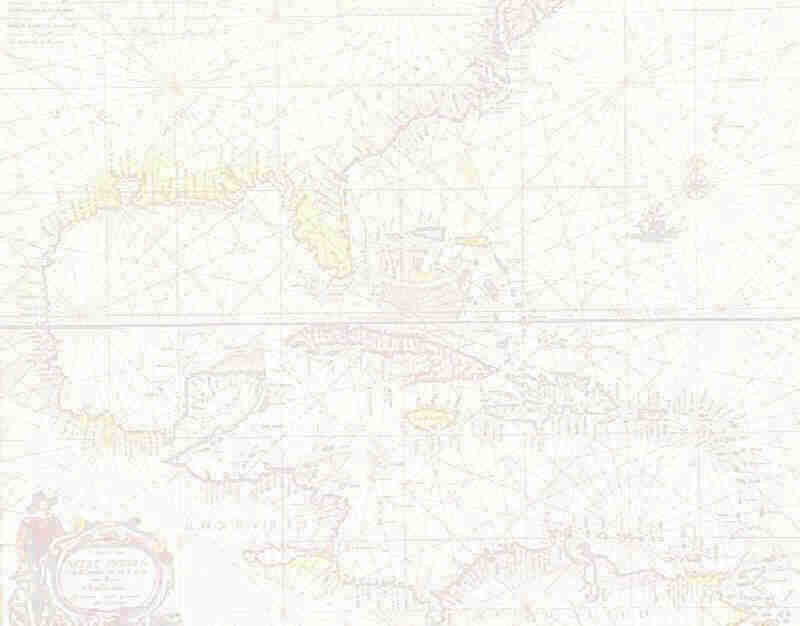 One can draw a detailed worldmap with rivers, see borderlines and over 2700 towns. It is Bi-Lingual; you can choose between German and English. The program was developed using MSDEV 4.0 (Microsoft Developer Studio) Visual C++, with the help of the Foundation Classes (MFC) and OpenGL. The work was done on a 100 MHz Pentium system under Windows 95. The diplomawork was developed between the 23.Sep.1996 - 23.Dec.1996 (Version 1.0). Responsible Prof. : Dipl. Ing. Wolfgang Söll. Last update (Version 2.4) from February 10'th 2003. I hope that GPS is not only a toy for experts, but also for other people who want to play around with satellites. GPS was therefore programmed in a manner that working with the program should be fun rather then frustrating. There are enough possiblilities to configure the program to get some funny results. The handling of the views is very simple. All one needs to do is to use the mouse to zoom, rotate and / or pan the view. The timefactor can be adjusted by using the slider control at the lower right of the main-frame.